A moth caterpillar commonly bred to provide fish bait feasts on a notoriously resistant plastic, scientists reported Monday, raising hopes the creature can help manage the global problem of plastic-bag pollution. "This discovery could be an important tool for helping to get rid of the polyethylene plastic waste accumulated in landfill sites and oceans," said Cambridge University professor Paolo Bombelli, co-author of a study published in the journal Current Biology. Polyethylene represents 40 percent of Europe's demand for plastic products, mostly in the form of packaging and shopping bags. Taking many years to biodegrade, these objects constitute a serious hazard for the environment, especially for sea life, when they are not recycled. In the European Union, 38 percent of plastic is thrown out in landfills. The promising discovery centers on the wax worm -- the name for the caterpillar larva of Galleria mellonella, or greater wax moth. In its pre-caterpillar form, the species is commercially raised as maggots to provide fish bait and aquarium food. The moth is also a scourge of apiculture, laying its eggs in the precious honeycomb of beehives. The find happened by accident at the home of the study's lead author, Federica Bertocchini, a biologist at the Institute of Biomedicine and Biotechnology of Cantabria in Spain. Bertocchini keeps beehives as a hobby. "When I went to clean them for reuse in the spring, they were infested with (wax) worms," the researcher told AFP. "So I put them in a bag. Then, after a while, I saw the bag was full of holes and these caterpillars were crawling all around my place." Startled by the caterpillar's voracious appetite, Bertocchini and a team from Cambridge University decided to conduct experiments to find out just how much, and how quickly, the pests could consume environmentally harmful plastic. They placed hundreds of the small, yellowish creatures on top of a supermarket plastic bag. Within 40 minutes, holes began to form. Twelve hours later, the caterpillars had consumed 92 milligrammes (0.003 of an ounce) of the stuff, far swifter than fungus and bacteria would have taken. In their next test, the biologists confirmed that the larvae fully digest a plastic meal, breaking down its chemical components. 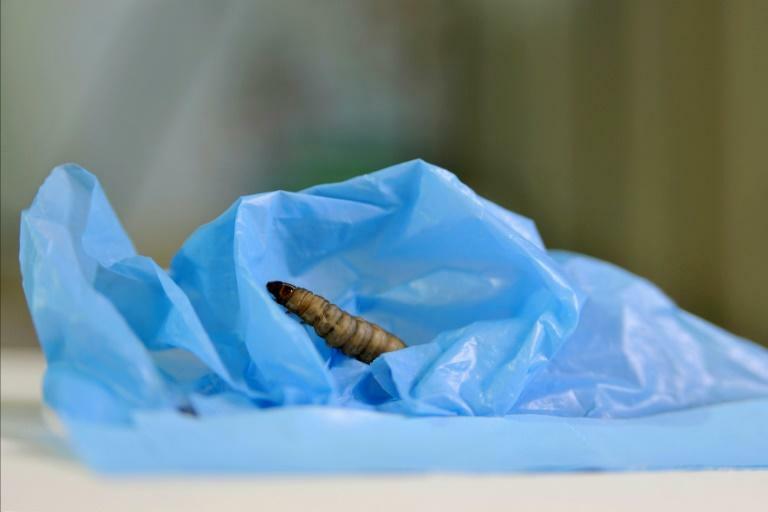 Covering a plastic bag with mashed-up caterpillars produced a similar results, suggesting that an enzyme or some other compound was at work. "The caterpillar produces something that breaks the chemical bond, perhaps in its salivary glands or a symbiotic bacteria in its gut," Bertocchini said. The answer may lay in the worm's habitat and eating habits. Growing in bee colonies, the moth larvae feed on beeswax, a digestive process that scientists believe may be similar to breaking down polyethylene. "Wax is a polymer, a sort of 'natural plastic,' and has a chemical structure not dissimilar to polyethylene," Bertocchini suggested. It remains unclear if a single enzyme or a combination of molecules are responsible for degrading plastic. But biologists hope to identify and reproduce the active agent artificially. 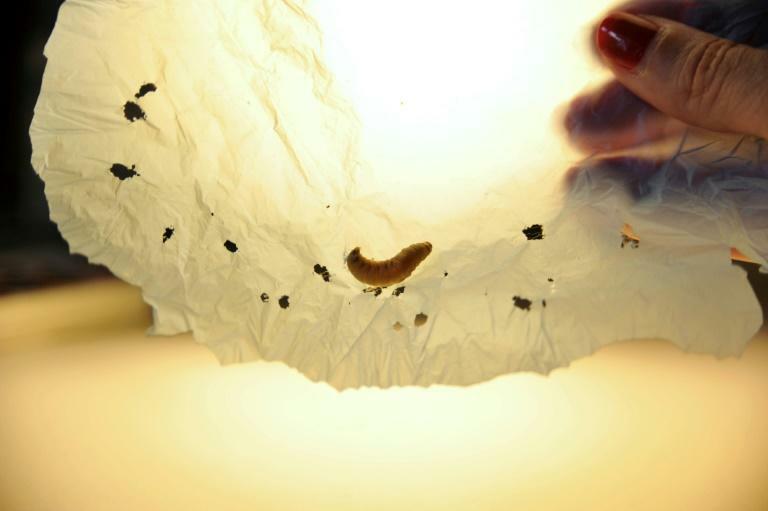 "Using million of caterpillars on top of plastic bags would not be feasible," Bertocchini said.